Luxury Beach House, Prime Ocean Views, Best Location! Sleeps 14 in 7 Bedrooms! 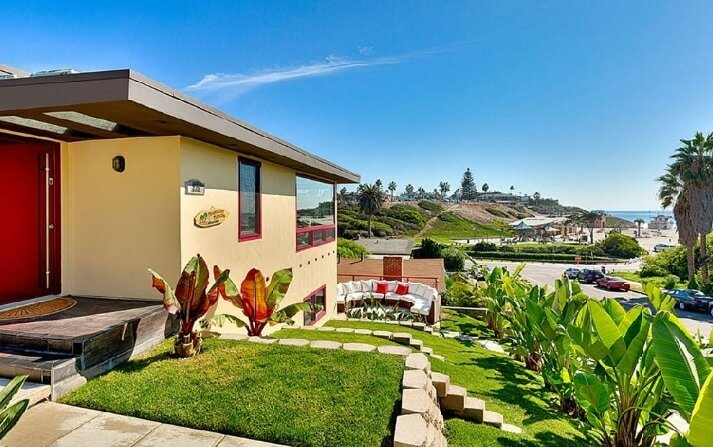 Sleeps 14 With 7 Bedrooms And Two Kitchens Right Across From Moonlight Beach! 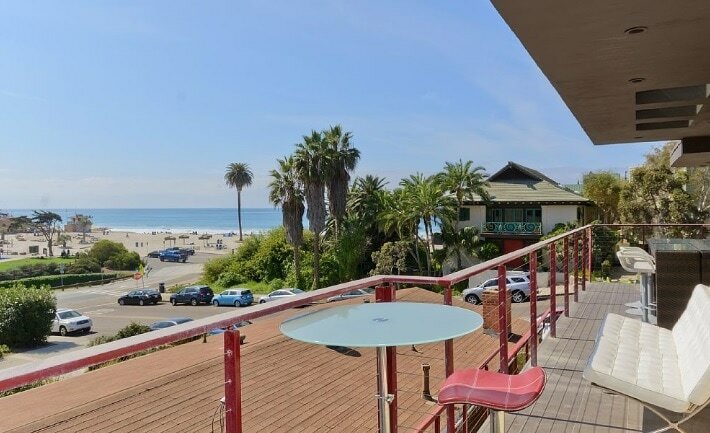 This gorgeous, contemporary beach house is ideal for walking steps to the famous Moonlight Beach and shops of the most iconic Southern California beach town, Encinitas in Northern San Diego. The house is across a cul-de-sac from this very popular, renovated beach area that looks like a scene from a movie. The playground, volleyball courts, beach bonfires, snack bar, and rental area are just a few yards away. Fantastic beach and ocean views are from the large living/dining/kitchen area and master and 2nd bedroom. This home is furnished it with mostly Pottery Barn and William Sonoma furnishings in a Modern/Beachy decor. Everything is new. All our rooms have brand new, high quality bedding and big murals on the walls. The bathrooms are all stainless steel and glass tile with high end fixtures. There are two main living areas with full kitchens and top of the line appliances. The TV room has a huge sofa that can fit 6-8 people can lay down in front of the 70 inch TV. There is also a large 55 inch TV in the living room and master bedroom. All the rooms have air conditioning and heat (rare in beach houses). There are two patios with ocean views. One on bottom the floor has lots of palm trees a grassy area, a hot outdoor shower, a large circular sofa set and a double daybed from Pottery Barn, a dining set for 10 and a barbecue and you can walk right out to the beach. The other is on the second, living room level and includes a counter height bar/dining set for 12 people perfect for sunset viewing. There is garage parking for 2 cars and 2-3 cars in the driveway. This is a great house for large families of all ages! Little kids will love the park and older kids will love the volleyball and beach access and everyone will have a great time at the bon fires. Older adults have easy access. The house is often used for Corporate and Wellness Retreats. There are also tons of activities at the beach: yoga, drum circles, tennis courts, restaurant, surf rentals, concerts, street festivals, surf lessons and day camps. A car is not needed. You can walk 2 blocks to the main street shopping and hip restaurants or take the train straight to downtown San Diego or LA and don't worry about driving home. This home truly has everything you need for a memorable vacation. This property is also very popular for corporate off-sites and retreats. There is plenty of room and seating for group presentations, great Wifi and unique group activities nearby to make your trip unforgettable.